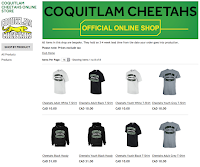 Coquitlam Cheetah t-shirts and hoodies can be purchased from the Coquitlam Cheetahs Online Shop until May 22nd. Payment is by credit card. All purchases must be made by May 22nd (no exceptions) with tees and hoodies to be delivered by June 12th. Please note that the club is not making any money from these sales to keep costs as low as possible for club members. Should you have any questions or issues, please deal directly with Kukri.